Barlowe's Herbal Elixirs is proud to offer an encapsulated customized herbal blend (Happiness Formula) which has been scientifically formulated to naturally and synergistically elevate the mood and relieve feelings of anxiety. It contains a proprietary blend of rhodiola rosea, theobromine, and albizzia flower extract. Bottled in Glass! No Stearates! No Fillers! No Junk! 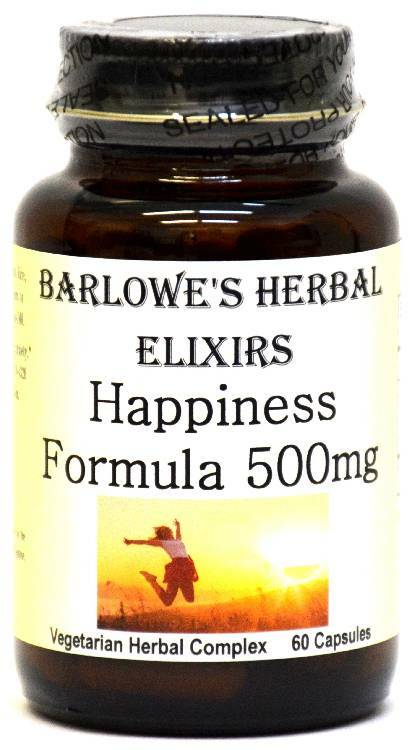 Barlowe's Herbal Elixirs is proud to offer an encapsulated customized herbal blend (Happiness Formula) which has been scientifically formulated to naturally and synergistically elevate the mood and relieve feelings of anxiety. Bottled in Glass! No Stearates! No Fillers! No Junk! ***These vegetable-derived capsules (Vegan, Kosher and Halal certified) are filled on slow speed equipment and only pure, unadulterated herbal extract is contained in the capsules. There are no magnesium stearates, fillers, gelatin, silicates, gluten, corn, wheat, rice, yeast, starch, titanium dioxide, artificial colors, artificial flavors or preservatives. Capsules produced with high speed equipment in herbal and dietary supplement "factories" generally contain several other ingredients, including powdered lubricants called STEARATES (which can greatly diminish an herb or supplement's absorption into the body). Check their labels! Barlowe also bottles his products in glass as he believes chemical vapors can vent from plastic containers and contaminate the contents and that glass is better for the environment. Happiness Formula contains several ingredients which provide a low-cost and non-addictive, yet powerful treatment against anxiety, and unhappiness in general. The purest, highest quality Theobromine is utilized to increase energy and feelings of well-being, by triggering the release of endorphins in the brain. Of course, Theobromine is the "feel good" ingredient in chocolate and cocoa, and is thus responsible for all the positive effects caused by eating chocolate, with none of the bad effects such as calories and tooth decay. The name Theobromine comes from the latin word "theobroma", which means "food of the gods." 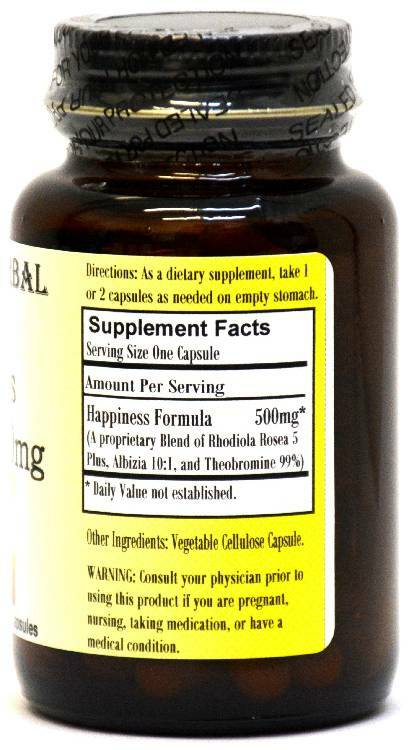 The second ingredient in Happiness Formula is the finest Rhodiola Rosea Extract, a potent adaptogen, which has been standardized to 3% Rosavins and 2% Salidrosides. Rhodiola Rosea comes from the arctic regions of the world. In Russia, Rhodiola Rosea has been utilized for hundreds of years to cope with the harsh Siberian climate and stressful life. In ancient times, the herb was known as "Golden Root", and it was actively sought out for its ability to delay aging, to energize the body, to help cope with stress and to increase sexual stamina. Rhodiola Rosea has also been shown to be very effective in improving mood and alleviating anxiety. Research from Russia has demonstrated that it improves both mental and physical performance, prevents altitude sickness, and reduces fatigue. Saratikov, A.S., et al. Rhodiola rosea Is a Valuable Medicinal Plant, Tomsk State Medicinal University, Russia: Russian Academy of Medicinal Sciences; 1987. In one documented study, the Rhodiola Rosea group decreased proofreading errors by 88% while the control group had an 84% increase in errors. Spasov, A.A., G.K. Wikman, V.B. Mandrikov, et al. A double-blind, placebo-controlled pilot study of the stimulating and adaptogenic effect of Rhodiola Rosea SHR extract on the fatigue of students caused by stress during an examination period with a repeated low-dose regimen, Phytomedicine. 2000 Apr;7(2):85-9. Rhodiola Rosea's beneficial effects, especially regarding mood elevation, are attributed to its ability to optimize serotonin and dopamine levels and its influence on opioid peptides like beta-endorphins. The specific plant-based (phytochemical) components which produce Rhodiola Rosea's beneficial effects are Rosavin, Tyrosol, Rosarin, and Salidrosides - components which affect multiple parts of the body to promote both physical and emotional well-being, and mental clarity. These components have furthermore been found to be useful in preventing occasional anxiety and panic attacks. Rhodiola Rosea also stimulates neurotransmitter activity in the nervous system, and enhances the permeability of the blood brain barrier to Dopamine and Serotonin. The final ingredient in this formulation is Albizzia Julibrissin 10:1 Extract, which is derived from the flowers of the Persian Silk Tree. Albizzia has been traditionally utilized in China for many hundreds of years to elevate mood and promote mental calmness. Its use was first documented in the Shen Nong Ben Cao (Divine Husbandman's Classic of the Materia Medica) during the 2nd century for its mood supportive and calming properties. In Traditional Chinese Medicine, the herb is generally known as the "Collective Happiness" and it is said to "nourish the heart and calm the spirit." A nourished heart and calm spirit is said to leave one at peace. Albizzia Julibrissin is known to be especially effective for bad temper, irritability, insomnia and poor memory due to "pent-up" emotions. Chinese people traditionally recommend its use for anyone who is suffering from grief as a result of a severe loss. Both the bark and the flowers of albizzia are used as a calming sedative in Asian traditional medicine. The bark is thought to "anchor" the spirit, while the flowers "lighten" it. Albizzia has been shown to boost seratonin levels. ATTENTION: IF YOU HAVE ANY PROBLEM ORDERING ON THE NEW WEBSITE, OR IF YOU HAVE ANY PRODUCT QUESTIONS, PLEASE CONTACT BARLOWE AT 954-479-4320. WE DO NOT ACCEPT PHONE ORDERS. SORRY. Caution: Barlowe's Happiness Formula is generally safe, but it is potent and should be utilized with care. Take no more than three capsules per day. If this product is taken right before bedtime, it may interfere with sleep. This product is for dietary use. If side-effects occur, discontinue use immediately! The capsules contain Theobromine, the active ingredient in chocolate, and therefore, the capsules are toxic to dogs and horses. Physiologically, dogs and horses process theobromine differently than humans. Happiness Formula should never be given to dogs or horses! Theobromine is also high in purine (uric acid) and if taken regularly, it is possible that it can contribute to the onset of gout in those prone to this illness. The above statements have not been evaluated by the Food and Drug Administration (FDA). This product is not intended to diagnose, treat, cure, or prevent any disease. Directions For Use: Take one capsule without food twice a day, morning and afternoon, or as needed. Results and usage amounts may vary based on body type, weight, and other factors.